← Design Culture Salon 4 — How does design function in a recession? Anyone who listened to Osborne’s delivery of the Budget Report, or read the subsequent media coverage, will be familiar with the ideological and moral way in which this debate is often framed. The concepts of recovery, growth and prosperity characterise the tone of a debate centrally focused on the aim of restoring the conditions of 2007 — and quick. Meanwhile, the design professions oscillate between gloomy pessimism and panic. The RIBA’s Business Benchmarking Survey 2011/12 stated that overall staffing across the profession was down by 25% and that ‘a generation of architects is in danger of being lost’ due to scarcity of work placements. The Design Industry Voices Report 2012 stated that 59% of staff interviewed wish to change job within a year and clients are expecting more work for less money, due to budget cuts. None of this seems to add up to a particularly hopeful or inspiring picture of Britain, the ‘Aspiration Nation’. On the other hand, the New Economics Foundation has been gathering support for its report on ‘Why We Need a New Macroeconomic Strategy’, which stated that ‘growth alone is not the best economic objective’, suggesting that there are ‘better metrics for assessing economic policy based on work created, real median incomes, well being and environmental change’. Looking at the problem from this angle opens up some of the spaces in which designers might begin to make helpful interventions. So, how should designers respond to these alternative views of the recession? As a dormant period to lie low through and wait for recovery? Or an opportunity to use their skills to improve the conditions we live in? The first to speak, Irena Bauman, spoke of the design professions as being in a state of ‘waiting’ for recovery and ‘business as usual’. Summarising the main challenge as the redistribution of social and material wealth between the 20% and the 80%, she also stated that some of the main obstacles lay in the arrogance of the design professions, which, bolstered by a narrow education system, have become ill-equipped in engaging with outside disciplines. As a direct answer to the question of the day, she argued that designers can thrive in the context of a recession, acting as ‘catalysts for social progress’ and ‘thinkers and agitators’. However, these deeply entrenched professional personality defects — vanity being one — need to be erased and over-written first. Bianca Eizenbaumer and Fabio Franz spoke of the difficulties of reframing the debate as to how designers can function in a recession without recycling old language about networking, social capital and career guidance, which are intrinsically focused on the concept of competition — by nature a divisive and unhelpful concept if we are to move beyond the individualism which got us into the crisis in the first place. Some of the most effective ways designers can act as agents in changing or re-orientating these debates are therefore by facilitating new relationships. Importantly however, they also highlighted some of the practical obstacles in achieving this, such as time, energy and the need to work outside the constant pressures of an industry that values the material rather than social value of work. Louis Moreno turned the question on its head by asking the audience to consider what had survived since 2007 and 2008 and to think about how effortlessly designers have already worked alongside politicians and policy makers in casually delivering change, as destructive as this might have been. With this in mind, he asked designers to become more awake to the agency they have in shaping infrastructure. In order to work most effectively, he argued that designers, urbanists and architects need to develop a tighter critique, generalising the politics of the design practice to everyday life. Jeremy Till stated the fundamental need to throw out this idea of the recession as a temporary blip and encouraged designers to ‘get used to it’, because it ‘might not be a bad thing’. Referencing the work of Tim Jackson, who has written a revisionist text about the idea of ‘Prosperity Without Growth’ and the New Economics Foundation, Till urged designers to re-evaluate and re-orientate their practices around new value systems. The ideologically charged concepts of austerity, progress and growth should be replaced with the idea of ‘scarcity’, which involves the redistribution of material and social wealth by optimising systems and resource flows. Speaking positively, he argued with confidence for the designer’s ability to make relational connections between the material, social, economic and cultural. This would be key in facilitating change. Time and speed for change was a central theme which emerged from the subsequent discussion. Guy Julier, chairing the salon, spoke of how the concept of ‘zombie capitalism’ is often used to describe the recession, but that this misleadingly evokes the image of a slow-moving corpse. In actual fact, much of the discussion about the designer’s role in re-designing social services is marked by a state of emergency rhetoric — things need to be re-designed immediately. The speakers agreed that slow, long-term solutions were often more effective. The subject of education dominated the latter part of the salon The audience and speakers shared their sense of frustration with the static nature of the training for both architect and designer. Fabio and Bianca spoke of how collaboration is often an afterthought, rather than a starting point of the learning process at design school. A member of the audience, while agreeing with this, warned that collaborative processes can be easily institutionalised. What is important is the designer’s agency in brokering collaborative relationships. It is therefore a unique process which cannot always be written into a university programme or teaching cirriculum. Although it was never overtly addressed as a theme, much of the discussion also revolved round the idea of dispensing with the emotional and ideological language which underpins debates about the recession and engaging in a more practical and constructive critique. The idea of the recession as a challenging design question was repeated. The salon suggested that designers can most powerfully function as brokers, activists, educators, policy makers. In this way, it was suggested that they could construct alternate visions of how the future might look. This post was guest written by Leah Armstrong, PhD Candidate at the University of Brighton and Research Officer in Contemporary Design Culture at the V&A Museum and University of Brighton. This entry was posted in design education, recession and tagged activism, design culture, recession. Bookmark the permalink. 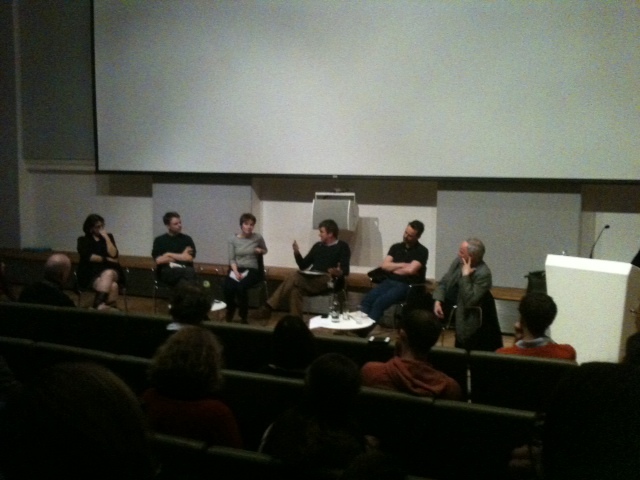 1 Response to Reflections on Design Culture Salon 4: How Does Design Function in a Recession?